Welcome to the Infinite Roofing & Construction blog! As Albany’s roofing expert, we’ll be using this blog to give you ideas, tips, and inspiration on everything related to roofing, siding, and home exteriors. Before we dive into more complex topics, we’d like to talk about the extensive benefits of replacing the roofing of your home. While a new roof can be aesthetically pleasing, it has a number of other benefits that can improve your personal well-being, too. Find out more detailed information on roof replacements here (also covers how to identify problem areas on your roof). A new roof doesn’t just prevent leaks—it can drastically improve your home’s value as well. A new roof has an average ROI of 67%, making it an excellent choice for a home improvement investment. 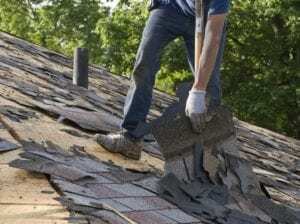 The benefits of a new roof can be critical during home inspection and home selling time as well. Home inspections that uncover issues with plumbing, electrical infrastructure, foundations, and of course, roofing, can make potential homebuyers skeptical, and can lead to reductions on the listed price of your home. When potential homebuyers hear there is a new roof on your home, it’s a symbol that your home is structurally sound and resistant to leaks and weather damage—making them that much more likely to take your home off your hands for the full asking price. You might not expect it to be true, but a roof is a huge component of curb appeal as it relates to resale value of your home. An old, damaged roof can take attention away from quality landscaping, curbing, and siding. Curb appeal is a homebuyer’s first impression of your property—if it’s not a good impression, you could be at risk of turning off potential homebuyers before they even walk through your front door. Old, leaky roofs can let water and moisture into your home—and with moisture comes mold, mildew, and bacteria that can be a detriment to your health. If you have the same roof for 10, 20, or 30 years, you could have a mess of bacteria seeping into your home that can cause allergies, headaches, respiratory issues, and a number of other health ailments. A new roof deflects all kinds of debris, moisture, and other environmental hazards, keeping your home airtight and free of anything that could compromise your health. All those cracks and holes in your old roof don’t just let bacteria in—they let your precious, air conditioned air out. A new roof allows your home’s air conditioner or HVAC system to work more efficiently, saving you a great deal of money on your energy bill. If you’re looking to stay in your current home for years to come, replacing your roofing could net you huge savings that make the initial expense of a roof replacement seem much more reasonable. If your roof is in rough shape—as in “putting pans down on the floor to prevent rainstorm flooding” shape—you’re spending a lot of your time frustrated and stressed over whether or not your roof is going to hold up. A home does not feel like a home without a strong roof above your head, so you owe it to yourself to have the necessary replacement or repairs done to ensure that your home feels safe, sturdy, and comfortable. For the best roofing in Albany, Schenectady, and Troy, you need Infinite Roofing & Construction. We’re dedicated to providing you with the highest quality roofing and siding solutions, and we’re passionate about relieving the frustration that comes from having an old, dilapidated roof. Infinite Roofing & Construction is not your average roofing company—contact us today!